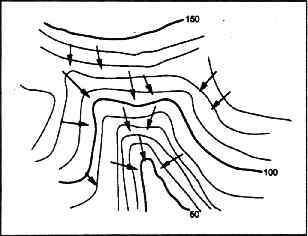 4) Check the slope of the landscape by locating two adjacent contour lines and determining their respective elevations. The slope is calculated as the changed in elevation divided by the distance. 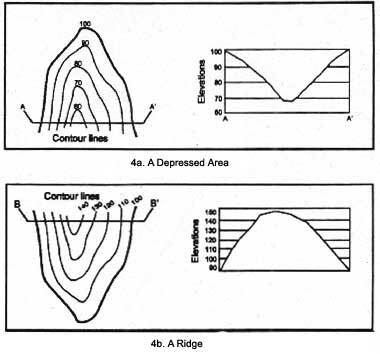 A depressed area (valley, ravine) is represented y a series of contour lines "pointing" towards the highest elevation. A higher area (ridge, hill) is represented by a series of contour lines "pointing" towards the lowest elevation. 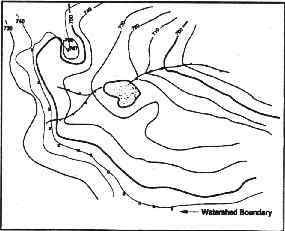 5) Determine the direction of drainage in the area of the waterbody by drawing arrows perpendicular to a series of contour lines that decrease in elevation. Runoff seeks the path of least resistance as it travels down a slope. The "path" is the shortest distance between contours. 6) Mark the breakpoints surrounding the waterbody. 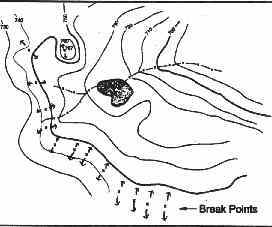 The "break points" are the highest elevations where half of the runoff would drain towards one body of water, and the other half would drain towards another body of water. 7) Connect the break points with a line following the highest elevations in the area. The completed line represents the boundary of the watershed. Congratulations! You have successfully mapped a watershed! Once the geography of you watershed is mapped, it is a good idea to also overlay the soil types, critical sources of AMD, and any industrial or residential areas. Books containing soil type maps are available through the county Soil Service office. If you have been viewing the information on watershed assessment, click here to return.